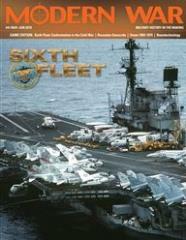 Sixth Fleet is a two-player, strategic-level wargame of the struggle for the Mediterranean set during a hypothetical Warsaw Pact versus NATO war during the 1970s and 1980s. It is primarily a naval-air conflict, with some elements of power projection using ground forces. The game map represents various sea zones (or zones) within the Mediterranean, as well as adjoining land areas. Critical bases for both sides, including neutral nations are also depicted. Aircraft units represent one to six squadrons, with the counter displaying the primary type of aircraft. Ship units represent one fleet aircraft carrier or battleship and “divisions” of four cruisers or nuclear-powered submarines with destroyers being represented in squadrons of six to eight destroyers or non-nuclear subs. Other ship types are represented at the division level and represent various numbers of ship types. On the map, each inch equals 20 miles. Each turn represents from one day to one week of activity, depending on the level of activity. Sixth Fleet is based on Red Dragon Rising. Changes have been made based on the situation in the Mediterranean during the Cold War.